Figure 1: BG 4 parts on a virtual benching table. Researchers at the National Institute for Occupational Safety and Health (NIOSH) Office of Mine Safety and Health Research (OMSHR) have been conducting research aimed at assessing the utility of virtual environments for teaching critical mine emergency response skills. As part of this, researchers developed the Draeger BG 4 Benching Trainer software. 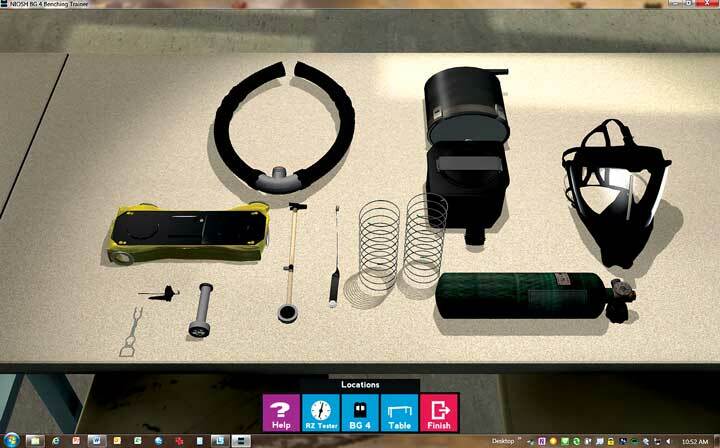 The software allows mine rescue benchmen and other team members to inspect, assemble and test a BG 4 mine rescue breathing apparatus in a virtual environment. The software is ideal for benchmen and other mine rescue team members to use to mentally practice benching the apparatus during or between regular training sessions. Mine rescue instructors can also use the BG 4 Benching Trainer software as a supplemental method to introduce new team members to the apparatus, and to provide targeted training to team members who may have difficulty with one or more segments of the BG 4 benching process. NIOSH chose to develop this proof of concept training tool around the Draeger BG 4 apparatus because it is the most commonly used mine rescue breathing apparatus in the United States. 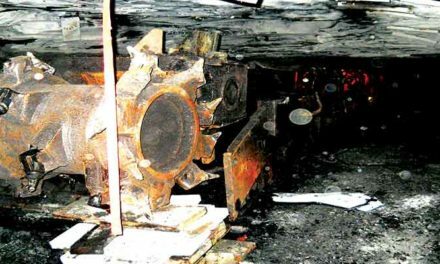 Data from the Mine Safety and Health Administra-tion (MSHA) published in 2014 reported there were 382 underground mine rescue teams in the United States. Of these, 185 served metal/nonmetal mines and 197 served coal operations. Across all underground teams, there were 2,692 mine rescue breathing apparatus in use. Of this number, 1,947, or 72.3%, of the apparatus were the Draeger BG 4 (MSHA, 2014). 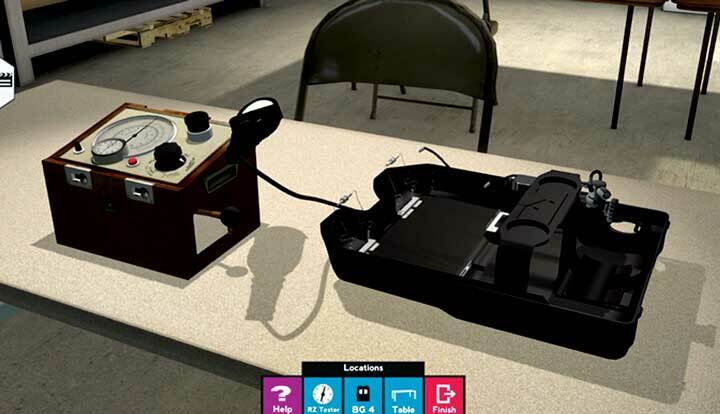 The BG 4 Benching Trainer is an example of a “serious game” that builds on previous NIOSH simulation research, as well as the latest developments in serious game technologies. Serious games use computer game technologies and gameplay principles for purposes beyond entertainment, such as training, assessment or marketing. As one example, in 2008, “FoldIt,” a protein folding serious game developed by the University of Washington’s Center for Game Science, challenged its users to design better proteins using the in-game tools. In 2011, players of the game created an enzyme that scientists had not been able to replicate during 15 years of using traditional research methods (Khatib et al., 2011). More recently, studies have been conducted looking at the use of serious games for medical applications including teaching patients limb movement following stroke (Ma and Bechkoum, 2008) and for enhancing technical surgical quality for new surgeons (Crochet et al., 2011). The military, emergency response planners and the mining industry currently use serious games for a variety of purposes. In 2009, NIOSH released the Underground Coal Mine Map Reading Training, a serious game that teaches and tests mine map reading skills (Mallett et al., 2009). Trainees learn terminology and concepts needed to read and understand an underground mine map. Trainees then navigate within a virtual mine environment while at the same time learning about different mining concepts and terminology. This training module has been used to introduce new employees to the underground mining environment without them having ever been in an actual mine. The benchman is a mine rescue team member whose responsibility is to inspect, prepare and test the team’s closed-circuit breathing apparatus. Federal law requires a person to have training in the use and care of the breathing apparatus used by a mine rescue team. This is to inspect and test the apparatus no less than every 30 days (30 CFR 49). Most mine rescue teams have a member designated as their benchman. Using a procedural systematic method, the benchman visually inspects the parts of the apparatus before reassembling them into the housing. Once assembled, the benchman tests the reassembled device for leaks, positive air pressure and other functions before a rescue team member uses the apparatus. Team members are also expected to know the basics about the care and functioning of their apparatus because they may be required to use it in potentially life-threatening environments. They rely on the expertise of their benchman to ensure their apparatus are fully functional should that time arise. Currently, turnover of mine rescue team members is common as a result of members retiring from the workforce, leaving the team to take another job at a mine, or being unable to commit to the training time requirements. There are also a number of composite mine rescue teams, made up of members who commonly work for different companies. Generally, these members travel to a designated mine rescue station for regular training. Whether their apparatus are stored at their mine site or at some central station, benchmen and other team members often do not have ready access to an apparatus for benching practice. Therefore, it is important that all rescue team members, not just the designated benchman, have training on benching their BG 4 apparatus. 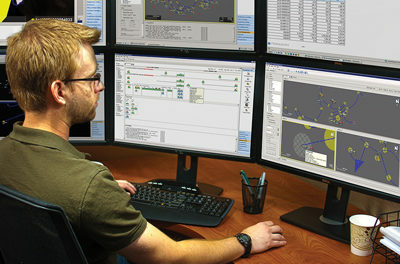 Composite mine rescue team members can use the BG 4 Benching Trainer software between hands-on training sessions to help maintain their benching skills. The module is also an ideal supplemental training tool that can be used to train new apparatus benchmen and team members. Training mine rescue personnel to properly check the working condition of their breathing apparatus helps ensures their safety and well-being when responding to an emergency. Federal regulations require each mine rescue team member to complete an initial 20 hours of instruction on the use and care of the breathing apparatus used by their team. After initial training, team members must wear their apparatus under oxygen for at least two hours every two months. Actually wearing the apparatus is important to understand their use and function. Hands-on training and practice with actual devices is also critical to becoming proficient in benching that apparatus. Hands-on training is the main method used to train team members to bench apparatus, including the Draeger BG 4. PowerPoint presentations and training videos demonstrating the benching process can supplement team training. Often, teams spend time training for apparatus benching as part of mine rescue competitions to reinforce skills. During timed competition benching, judges may place one or more flaws, or “bugs,” in the apparatus. A flaw can range from a tear in a breathing air bag to a missing O-ring. The benchman working on the unit must find the flaws by visually inspecting the parts of the unit and testing it to determine what the flaw may be. They must also assemble the unit, with no flaws remaining, in the correct sequence. Like live hands-on maintenance training and competition training, the BG 4 Benching Trainer software’s scenario builder feature permits trainers to insert one or more flaws that trainees must find and correct before testing the apparatus on the virtual Draeger RZ Tester. Draeger BG 4 benching makes use of motor skills for completing the task. Motor skills are those used by trainees to disassemble, manipulate and replace various BG 4 components. Regardless of the task, a person’s motor skills degrade over time if they do not use them regularly. Mental practice has been shown to reinforce motor skill retention and lead to improved task performance. Research conducted by the U.S. Bureau of Mines looked at using mental practice for helping miners remember the self-contained self-rescuer (SCSR) donning sequence. Trainees who regularly used a mental practice aid showing a “3+3” SCSR donning sequence performed more proficiently 90 days after initial training than did trainees who did not have the mental practice aid (Vaught et al., 1993). More recently, mental practice has been used in other settings to improve motor skills including learning and retaining sequencing skills (Wohldman et al., 2007), neurological rehabilitation of patients following stroke (Mulder, 2007) and enhancement of surgical skills (Arona et al., 2011). BG 4 benching also involves the use of cognitive skills. Cognitive skills are those that make it possible for individuals to process information for a variety of reasons including performing tasks. Cognitive skills are made up of declarative knowledge or factual information (Driscoll, 2000). In the case of the BG 4, declarative knowledge includes understanding of apparatus components, how they function and flaws that can exist within each component. Cognitive skills also include procedural knowledge — that is knowing how to do something and being able to demonstrate how to do it (Driscoll, 2000). Knowing how and in what order the BG 4 components fit into the case and how the breathing circuit is tested are examples of procedural knowledge. Utilizing both declarative and procedural knowledge, trainees practice the task of benching a BG 4. As they continue to practice, trainees’ ability to bench the apparatus correctly continues to im-prove. With sufficient practice, trainees potentially can seamlessly and auto-nomously bench the apparatus. The BG 4 Benching Trainer software supplements hands-on training in maintaining cognitive skills by giving trainees the opportunity to use procedural knowledge to tear down an apparatus, test it, and put it back together along with declarative knowledge used in examining components for flaws and assembling it in the correct sequence. The BG 4 Benching Trainer software also helps trainees sharpen and maintain motor skills by mentally practicing benching the apparatus. NIOSH developed the BG 4 Benching Trainer software by integrating realistic 3-D models of the apparatus with a robust user interface into the Unity game development platform. Service and training representatives from Draeger acted as subject matter experts and provided a working BG 4 apparatus for software developers to use as a reference as they created the 3D image content. The system requirements to run the software are: Microsoft Windows 7 or Windows 8, dual core processor or equivalent, at least 4 GB of RAM, a non-integrated graphics card, and 500 MB of free disc space. After launching the software, the trainee enters a virtual training room by a table with all the BG 4 parts on it (Figure 1). There is an empty BG 4 case to the right of an RZ tester unit (Figure 2). Using the computer mouse, the trainee can select BG 4 parts from the table. The selected part will slide into view, allowing the trainee to rotate it and inspect it at different angles. Trainees can “explode” the view of a part to see the subcomponents or a larger surface area of the part. They can “swap” parts if a flaw is found and then place the part in the correct location in the case. If the trainee is new to benching the BG 4, there are animation videos showing how the part correctly fits in the case. After examining and assembling the BG 4 parts, the trainee can test the apparatus on a virtual RZ Tester, which allows them to complete all the tests needed to bench the unit. The software includes different modes of operation to help the trainee learning how to bench an apparatus as well as to help the trainer who is using the software to teach. There is a tutorial mode that explains how to navigate through the software and use its tools. The intro to BG 4 mode is useful to new trainees since they are able to work at their own pace while practicing benching. The quick bench mode randomly places flaws into parts and functions much like a real-life benching competition. The scenarios mode is useful to trainers who wish to create custom scenarios for their trainees. This allows trainers to pick specific flaws for their customized training session. An instructor’s guide designed for use by the trainers is also included with the software. The BG 4 Benching Trainer software has a scoring feature that allows trainers and trainees to assess performance. After a benching session is completed, the software presents a printable score sheet that includes the name of the trainee, the time it took to complete the exercise, and a tally of the total score that may include discounts if the user failed to find a flaw or complete a test. This can be useful for a trainer to assess the competency of trainees when learning how to bench by using the software. The BG 4 Benching Trainer software is adaptable in different training settings to meet the needs of trainees (Figure 3). Ideally, each trainee should run the software on his or her own PC or laptop. However, two or three trainees can work together at a single PC or laptop and help each other while benching the virtual apparatus. In a larger group setting, trainers can use a video projector to display the screen from a single computer. This approach is useful for introducing the BG 4 apparatus to new mine rescue team trainees who have never worked with the apparatus. As part of the NIOSH training evaluation process, researchers administered surveys to the 30 rescue team members who tested the BG 4 Benching Trainer as a way of getting a sense for the different levels of experience represented among mine rescue team members and whether or not they thought the training was worthwhile and relevant. About one-third of trainees had prior virtual reality experience, and about one-third had real emergency experience as a mine rescue team member. Additionally, around half had at least one year of apparatus benching experience. Researchers found that while nearly everyone thought the training included relevant content and gave them new ways to think about benching, trainees who had more benching experience were more likely to say that they would recommend the training to other mine rescue team members and benchmen. This group also said that when it comes to benching training, instruction in a virtual environment is a good supplement to training in a real-life environment. Additionally, compared to those that had not experienced a real mine emergency, trainees who had the real-world mine rescue experience were even more likely to think that the training covered knowledge and skills needed during a real mine emergency. This group felt that the training made them better prepared and more confident that they could correctly bench a BG 4 during a real mine emergency. These findings suggest that the BG 4 Benching Training module is a viable training product and has strong potential as a supplemental training tool for future generations of mine rescue team members. The BG 4 Benching Trainer Software allows mine rescue team members of all levels of experience to practice benching a virtual BG 4 on a laptop or PC. Field testing of the software with 30 mine rescue team members revealed that trainees judged the module to be useful for teaching BG 4 benching skills and that the module helped them learn new ways to think about apparatus benching. The BG 4 Benching Trainer cannot replace actual hands-on training, but can serve as a high-fidelity, cost-effective training supplement to aid mine rescue team benchmen and other team members in maintaining and improving their knowledge, skills and abilities in benching an apparatus. This software is downloadable from the NIOSH mining website at www.cdc.gov/niosh/mining/Works/coversheet1877.html. Jason Navoyski is a visual information specialist for NIOSH-OSMHR; he can be reached at email: isb2@cdc.gov. Michael J. Brnich, Jr., CMSP, is lead mining engineer and team leader (Acting) for Mine Emergency Systems of the NIOSH-OSMHR Human Factors Branch; he can be reached at email: tzb9@cdc.gov(? )and Timothy Bauerle, MA, is a behavioral scientist for NIOSH-OSMHR; he can be reached at email: tbauerle@cdc.gov. Arona, S.; Aggarwal, R.; Sirimanna, P.; Moran, A.; Grantcharov, T.; Kneebone, R.; Sevdalis, N.; Darzi, A. . Mental Practice Enhances Surgical Technical Skills. Annals of Surgery, Vol. 253, No. 2, pp. 265-270, February. CFR. Code of Federal Regulations. Washington, D.C.: U.S. Government Printing Office, Office of the Federal Register. Crochet, P.; Aggarwal, R.; Dubb, SS; Ziprin, P.; Rajaretnam, N.; Grangcharov, T.; Ericsson, A.; Darzi, A. . Deliberate Practice on a Virtual Reality Laparoscopic Simulator Enhances the Quality of Surgical Technical Skills. Annals of Surgery, Vol. 253, No. 6, pp. 1216-1222, June. Driscoll, MP . Ch, 10, Gagne’s Theory of Instruction. In: Psychology of Learning for Instruction. Boston MA: Allyn and Bacon, pp.341-372. Khatib, F.; Cooper, S.; Tyka, MD; Xu, K.; Makedon, I.; Baker, D.; Foldit players . Algorithm discovery by protein folding game players. Proceedings of the National Academy of Sciences of the United States of America. Vol. 108, No. 47, pp. 18949-18953, 2011. Ma, M.; Bechkoum, K. . Serious Games for Movement Therapy After Stroke. In: Proceedings IEEE International Conference on Systems, Man, and Cybermetics (SMC 2008), pp 1872-1877. MSHA . 2014 Mine Rescue Teams – Nationwide listing [http://www.msha.gov/minerescue/MAP/ASP/minerescuehome.asp]. Date accessed: May 13, 2012. Mallett, LG; Or, TJ; May, I.; Cole, GP; Lenart, PJ; Unger, RL; Beshero, DC; Hall, EE; Vaught, C.; Brune, J.; Klein, K. . Underground Coal Mine Map Reading Training. U.S. Department of Health and Human Services, Public Health Service, Centers for Disease Control and Prevention, National Institute for Occupational Safety and Health, DHHS (NIOSH) Publication No. 2009-143c. Vaught, C.; Brnich, MJ; Wiehagen, WJ; Cole, HP; Kellner, HJ . An Overview of Research on Self-contained Self-rescuer Training. Washington, D.C.: US Bureau of Mine Bulletin 695, 19 pp. Wohldmann, EL; Healy AF; Bourne, LE . Pushing the Limits of Imagination: Mental Practice for Learning Sequences. J. Exp. Psychology: Learning, Memory, and Cognition, Vol. 33, No. 1, pp. 254-261.